The Vice-County Rare Plant Registers are an initiative of the Botanical Society of Britain and Ireland to summarise the status of rare and conservation-worthy plants in each vice-county. 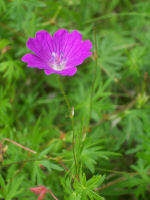 The intention is to create an up-to-date summary of the sites of rare plants and their status at these sites. Rare Plant Registers intend to identify gaps in our knowledge, aid conservation efforts and encourage monitoring of our rare plants. Registers for many other counties are available on the BSBI's website. Please contact your Vice County Recorder with any additional records or corrections.